The last time we had a warm, settled summer and autumn the kahawai started to appear in the northern estuaries around the end of April. When you get gin clear water, a chilly start to the morning and the promise of a nice sunny day this is what will likely happen…..
“The strident alarm clock broke the early morning silence at 6.00 am and I dragged myself out of bed eager to see what the day would hold. I tentatively opened the back door and was greeted with conditions absolutely perfect for fishing. Clear bright skies, no wind, plenty of residual moonlight and a chilly 7oC to heighten the senses. I quickly downed breakfast, followed by a steaming mug of tea, and made my way down the drive to open the gate. In the front garden a Tui was leading the dawn chorus. The initial prelude to his distinctive deep throated gurgling call sounded like a dial up internet connection but when he launched into song proper the effect was crisp and delightful. The perfect start to a beautiful day. Stuart and I rendezvoused at 6.45 am and tackled up near the cars before ambling across the grass to the steep path that leads down to the Manukau harbour. The stillness and silence was incredible. It was so quiet every sound appeared highly amplified. You could almost hear insects passing wind. We reached the foreshore at 7.05 am and made our way around the nearest bay to our favourite fishing platform in the half light. The harbour was absolutely still, glass like. The moon was casting an eerie glow on proceedings and there was an amber hue on the horizon which was reflected back off the water surface. Stunning. For a change the water clarity was excellent and every feature on the bottom was clearly visible. I mentally ran through my checklist for success on the Manukau. Gin clear water – check, No wind – check, last hour of the outgoing tide – check and change of light – check. This session was going to be interesting. We opted to fish with Gulp! 3” Natural Shrimps on ½ oz. Jig heads and I threaded one on and made my way to the water’s edge while Stuart made final preparations. My first cast into the harbour was carefully worked back into the shallows unmolested. Just as the lure reached the rod tip a kahawai school erupted about 30 metres to my left and showered bait fish everywhere. Stuart implored me to cast into the maelstrom and I needed no second invitation. 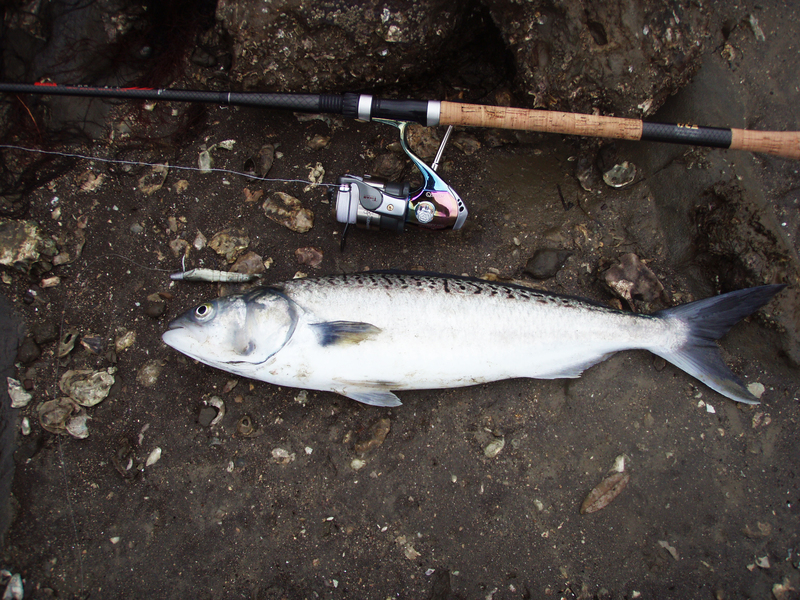 The lure arched gracefully and plopped into the estuary near the scene of the carnage. In the twinkling on an eye it was spanked by one of the kahawai shoal. I struck, the rod bent into a healthy curve and line poured from the spool as the kahawai hit the GO button. (see photograph entitled – hooked up in the half light). I applied heavy side strain and was able to get it to turn and run parallel to the shore. It charged up and down for a few minutes but was more intent on fighting the pressure than pulling string. The rest of the battle is a blur but soon I was able to beach 3 ½ lbs of prime kahawai. Yahoo! High fives all round. While I unhooked and dealt to the kahawai Stuart began enthusiastically peppering the area where the kahawai had corralled the baitfish. Nothing doing. I returned to the shore about 30 metres away from where he was stationed. By now, kahawai were working in isolated pockets all along the shore line near us and you could clearly see the bow waves of the larger fish as they hounded prey in the shallow margins. I opted to go long out into the channel and work the lure back to the shore as I was sure that the kahawai would be holding on the lip of the channel in between forays. 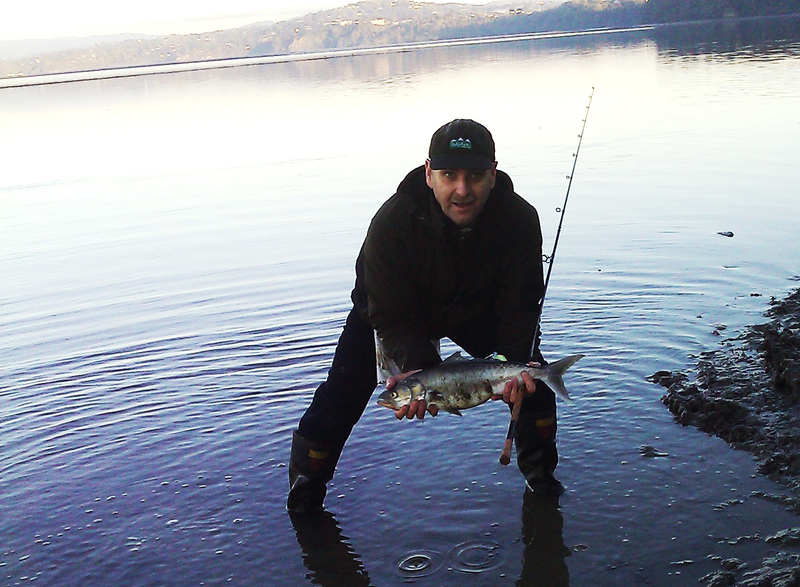 Cast #3 plopped heavily in the estuary and the lure sank slowly to the bottom. I gave it a sharp twitch, paused and felt the lure being mouthed. Up came the rod tip hard and on came the pressure. Game on! This kahawai was a better specimen and it broke through the surface of the water like a Polaris missile almost immediately. Vertical exit, belly flop entry. It then proceeded to pull string in a concerted burst as it sought the sanctuary of the deep water. Again I was able to turn its head and steadily work it back towards the shore. This fish did not want to come in though and spent the next few minutes fighting hard against the drag while running parallel to the shore. Eventually its resolve faltered and I was able to beach it. 5 lbs of prime Manukau muscle. Two fish in 3 casts. Surely I was dreaming?! We opted to keep this fish for the smoker as it had swallowed the lure deep into its gill area and was bleeding so I headed up the beach to deal with it and take some photographs. I could not get any decent shots as the dew and poor light seemed to be affecting the viewfinder on my camera. Giving up in frustration, I headed back to the shore to re-commence casting. All the while the kahawai kept on patrolling the shallows and charging in to attack isolated groups of bait fish. I again opted to go long and the next cast came back festooned with weed. I thought I’d felt a touch when I was bringing the lure in so I decided to slow up my next retrieve and see what happened. Out went the lure and a few seconds later I felt it hit the bottom. I gave it a twitch and waited for what seemed an eternity. After a couple more seconds the rod tip started to nod as the soft bait began to be mouthed. Nod, Nod, Nod, Strike. Game on again! This fish opted not to head for the deep water but instead spent the next few minutes running up and down the estuary parallel to the shore shaking its head furiously in an attempt to rid itself of the hook. It took to the air a couple of times in the shallow water but was clearly spent by the time it was beached. Another 5 lb brute which was promptly released. My lure was a mess by now so I had to go back up the shore to get another and thread it on. I took two steps from the shore and, out of the corner of my eye, saw Stuart strike hard. The fish struck back with equal venom and line poured from his reel. The drag was set light and squealing like a gut shot pig as the fish headed south at speed. He quickly adjusted the drag pressure and set about regaining some of the line and control. The kahawai was having none of this and gave him a torrid time even when he got it in close (see photograph – Stuart tussling with a stroppy kahawai). Eventually he managed to beach and release the fish and he was ecstatic. Top effort! Note the profusion of rock oysters in this photograph. It would be impossible to fish here at high tide without losing a serious amount of tackle. 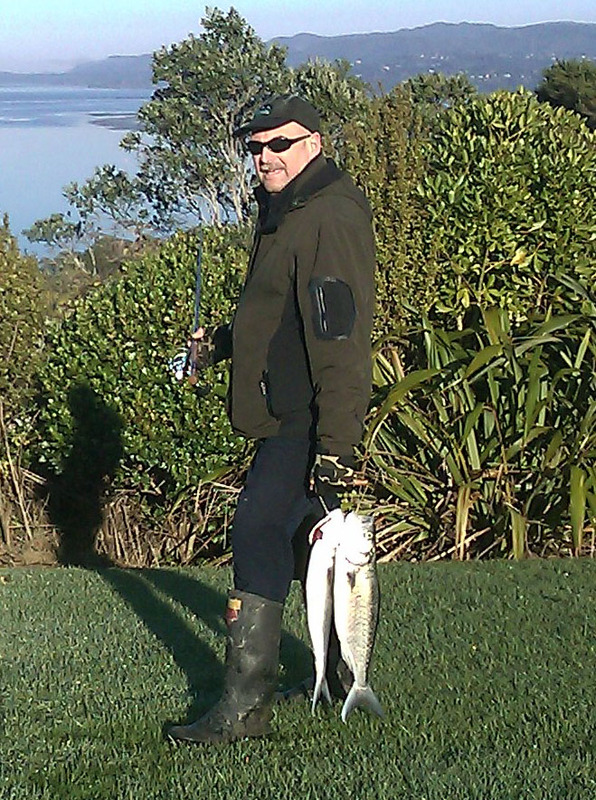 We kept on fishing and by 8.10 am we’d landed 9 kahawai between us. I caught 7 between 3 ½ lb – 6 lb and both of Stuart’s fish were around 4 lb. Magnificent sport. NINE decent fish in one hour. Staggering stuff from a harbour that yielded nought for our first 10 trips. I reckon that I would have only cast 20 times in the session. An unbelievable turn around in fortune. Two other fishermen arrived at 8.10 am armed with 13’ surfcasting rods, spinning reels and a bucket full of frozen bait. Their arrival coincided perfectly with my last fish which proceeded to jump 12 times in the shallow water as if to show them what they had been missing. They were gobsmacked that we had caught anything on lures and you could see them rubbing their eyes in disbelief at what they had just witnessed. I gave them a couple of lures and we got talking as “brothers of the angle” are wont to do. Apparently they caught Snapper in this channel in January – February but from the promontory south of where we were fishing this morning. Something else to try when summer returns. They cast out as we were leaving and manage to catch a small kahawai (~ 2 lb) in short order. Again another small fish caught on bait. Hopefully we are starting to get the hang of the Manukau harbour now. The key factors are water clarity, last hour of the outgoing tide and no wind. If these three factors meet with the change of light then it promises to be a good session.